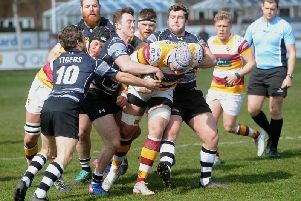 Fylde RFC left it as late as can be to record a fourth straight win with a 20-17 defeat of Wharfedale. With the scores level, Greg Smith landed a long-range penalty with the final kick of the game to break the hearts of Fylde’s gallant visitors. Wharfedale kicked off towards the clubhouse and, after an early knock-on, forced a scrum that set the tone for the day at that particular set-piece by earning the first of six scrum penalties. On six minutes, Dale had another scrum near Fylde’s 22 with Jack Blakeney-Edwards taking on the line and slipping through before drawing the last defender and giving centre Rhys Lovegrove a run to the line. Blakeney-Edwards converted and it was 7-0 to the visitors but, three minutes later, Smith split the defence and with runners either side, he chose Connor Wilkinson. He easily beat the last defender and gave Smith an easy enough conversion to make it 7-7. The next 20 minutes saw the styles of play emerge with Dale’s preference a repeated drive and ball retention. Fylde, for their part, always tried to stretch the game and use their best assets in a less structured and open style of game, whatever the conditions are like. Four penalties apiece in that period demonstrated the relative parity of play although Fylde had the better scoring opportunities. Cameron Crampton’s kick nearly led to a try for Tom Carleton but the ball was lost in attempting to ground it, while a 50-yard break from Sam Dugdale ended with a desperate tackle forcing a forward pass. A scrum penalty in Fylde’s favour on the half-hour allowed them to kick close to the opposition line. Nick Ashcroft’s lineout take set up a driving maul from which Ben Gregory went over with Smith’s conversion putting Fylde 14-7 ahead. However, another scrum penalty – this time for the visitors – allowed Blakeney-Edwards to kick a penalty and peg Fylde back to 14-10. Smith then returned the favour with one of his own as the players took a break from the rain with Fylde 17-10 up at half-time. The second half kicked off with Ben O’Ryan on for Dugdale and the gloom ever worsening. It developed into a bit of a battle in the trenches with every yard forward hard earned and chances to spread the ball wide or get the scoreboard ticking at a premium. The second half developed into a real arm wrestle and defence took its toll with Harlan Corrie replaced near the hour mark by Matt Garrod, who showed his versatility as he came on at blind side flanker while Elliott Horner was replaced at prop by Adam Joyner. Wharfedale turned down a kickable penalty to go for the lineout and drive option but Fylde forced a penalty in the turnover and cleared their lines. Fylde’s best scoring opportunity came when Olli Parkinson charged down a Wharfedale kick before he and Garrod set off in pursuit, causing chaos near the Wharfedale line before the visitors were able to clear their lines. Wharfedale desperately searched for the converted try that would tie the scores and forced five penalties in a row from the 64th minute. The last of them, on 75 minutes, was to prove a pivotal point. A five-yard scrum on Fylde’s line saw the scrum collapse and, in doing so, cause a bad injury to Joyner whose kneecap was dislocated. It was obvious there would have to be a long delay, so much so that Fylde went back to the changing rooms. Fifteen minutes later, after Joyner had been taken to hospital, the game resumed with the scrum reset. Wharfedale went through three minutes of possession, battering away at Fylde’s line, and despite being repelled on several occasions, they maintained possession and composure. Prop Ben Sowry finally breached the defences by the post, leaving an easy conversion, and the first points of the second half had finally arrived to make the score 17-17. Fylde did not let the late score dishearten them and kicked off deep. Wharfedale earned a penalty, cleared to near their 10 metre line, secured possession at that lineout and worked their way side to side, looking to exit. Just when it looked like time was running out, Wilkinson spotted a slight delay in their supporting players and got his hands on the ball for a turnover penalty. It was still a difficult kick but Smith held his nerve to split the posts. The win sees Fylde move up to fifth and, next week, they are at home again when they welcome third-placed Huddersfield – and former Fylde favourite Chris Johnson – to the Woodlands. Fylde: Carleton, Bailey, Dowds, Wilkinson, Grimes, Smith, Crampton; Dugdale, Vernon, Corrie, Parkinson, Ashcroft, Lewis, Gregory, Horner. Replacments: Joyner, Ashma, Garrod, O’Ryan, Fowden. Wharfedale: Bullough, Wellock, Blackwell, Lovegrove, Cicognini, Blakeney-Edwards, Woodhead; Burridge, Tyson, Houghton, Rhodes, Hedgley, Ward, Stockdale, Altham. Replacements: Sowrey, Asejevs, Frost, Walker, Gaudie.